Today is the 92nd birthday of Pope Emeritus Benedict, who – with the exception, as we just witnessed, of the occasional ‘intervention’ as ‘Pope Emeritus’, unique in history as far as I can discern – he continues his life of seclusion, silence and prayer. Most of us wonder what the clear and precise mind of Benedict thinks of the current confusion and conflict, but, like most holy people, he keeps his cards close to his pectore, his heart, which as his life and his writing demonstrate, is filled with love for God and for his fellow men. Let us pray for the former Pope, that he does much hidden good in the time that remains to him. 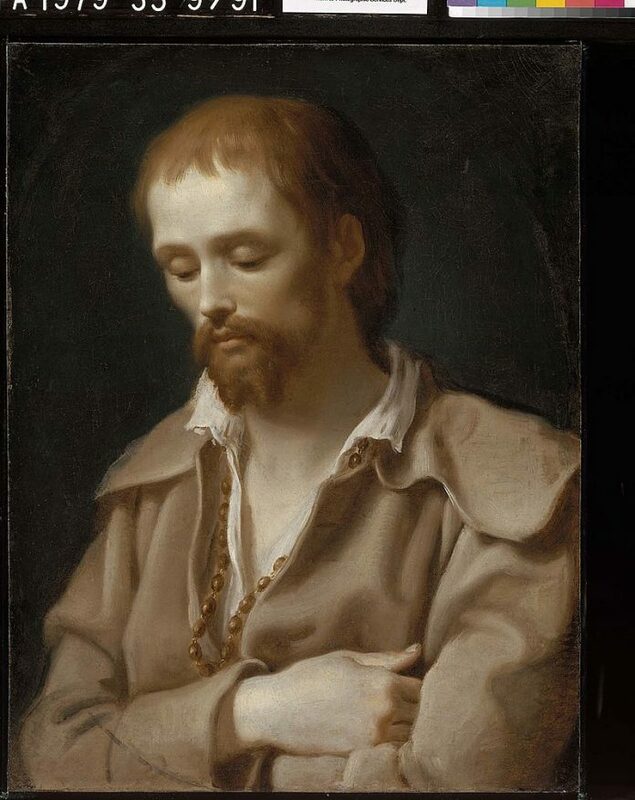 This day, providentially, also marks the anniversary of the death of Saint Benedict Joseph Labre, (+1783), who had a rather unique vocation, even though all ‘calls’ from God are in a sense unique. Benedict, an intense and pious young man from peasant stock in France, tried various vocations, educated for the diocesan priesthood, before being drawn, in his deepening prayer life, to the strict life of the Trappists, a French reform of the Cistercians begun by Father Armand Rancé in 1662. Considered too young and delicate, not fit for their austere life, Benedict was gently shown the door. He then tried the Carthusians and the Cistercians, but found their life constraining, and even the three meals a day too much ‘comfort’, if such be an adjective applied to the life these hardy men live. So Benedict enrolled in the Third Order Franciscans, and decided upon a new way to which he felt God calling him: To wander the earth as a pilgrim, penitential and alone, without cloister, not in the wilderness, but in the world, living amongst the poorest of the poor, visiting the various holy sites of Christendom. And so Benedict walked – or, we might say, tramped – quietly and anonymously visiting the shrines of Loreto, Assisi, Naples, Bari in Italy, Einsiedeln in Switzerland, Paray-le-Monail in France, and the famed Santiago de Compostela in Spain, always on foot, sleeping in the open, or in some corner, eating what was given him or the scraps others threw away, often giving his own meagre portion to someone he thought more in need than he. On his way through France, the saint accepted the hospitality of Matthieu and Marie Vianney, the parents of the future patron saint of priests, Saint Jean-Marie, the Curé d’Ars. Benedict talked little, prayed always, and accepted without complaint, even joyfully, whatever abuse he received. The lice that soon covered his emaciated body he offered up as a penance for sin. Yet people mysteriously recognized his sanctity, even as he stood, leaning on his stick, amongst crowds of beggars, and a strange, supernatural light was seen at times to emanate from his ragged body. Confessors recognized the spiritual depth of his conscience, and were astounded that this beggar knew so much. Benedict could read hearts, priests were soon asking him for advice and counsel. In a liturgical reversal, priests would find themselves saying Mass more devoutly, knowing, mysteriously, that they were being carried aloft by a shabby figure in the back pews absorbed in prayer. Saint Benedict finally ended up in Rome, sleeping in a cell in the Coliseum (back before it was all guarded with walls of security), visiting churches, his only journeys to the holy house at Loreto, praying before the Blessed Sacrament for the Church, the world, and its conversion. Benedict the Pilgrim died peacefully on this day in 1783, scarcely 35 years old, in a house near the ancient ruin, to which he was carried. In what seems a spontaneous, supernatural response, the children of Rome ran through the streets crying out ‘the Saint is dead, the saint is dead!’ Miracles abounded, inexplicably, cures, conversions…So many flocked to his funeral, that Benedict’s body had to lay in state for days, as though he were a Pope or potentate, and for weeks soldiers had to be posted around his tomb to control the mobs. Canonized by Leo XIII in 1881 (the same year he released his encyclical Immortale Dei on the necessity for the State to be Catholic, in some confluence of providence), Saint Benedict Labre is the patron of the homeless, and an intercessor for pilgrims, wanderers and all those who cannot find their place in this world, the apparently vocation-less, all those who, as Christ said of Himself, have ‘nowhere to lay their head’. There is a wonderful life of the saint by Agnes de la Gorce, which I am just finishing reading for the second time, the first years ago, which I highly recommend, if you can get your hands on a copy (one amongst many fine lives of the saints published by Sheed and Ward, this one in 1952). Some say Benedict Labre suffered from a mild form of schizophrenia, but I think that hypothesis a not very mild form historical revisionism. My own view is that Benedict saw farther than the rest of us, that, as Pope John Paul was later to exhort to his beloved young people, it is not so much what we do, but who we are that makes the difference. Benedict Labre saw everything and everyone sub specie aeternitatis, from the perspective of eternity, that this life provides no place of ultimate rest, but really is a pilgrimage, a path to our real home, where, as Pope Leo XIII wrote, only then will we truly begin to live. As Augustine warned centuries before, woe to those while journeying on the way and admiring the scenery, forget where they are going. Saint Benedict Joseph Labre, ora pro nobis!